There has been a bit of news regarding BBQ gas fires. 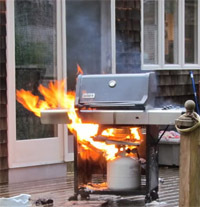 So, it’s worth taking the time to review BBQ safety. The NZ media is fond of reporting “exploding gas cylinders”. The reality is that gas cylinders rarely explode. In fact, it would be quite difficult to make one explode. Why is this? Well, gas cylinder valves are equipped with pressure relief valves. If the cylinder is exposed to excessive heat, the pressure relief valve allows the gas to vent and keep the pressure within safe limits. The worst thing that can happen is the venting gas ignites and you have a plume of flame. This will self-extinguish when the cylinder runs out of gas. This is why you always want to use your BBQ outdoors and away from your home or other flammable materials. So what is all the media hype about? Typically it’s about gas fires, not explosions, which result from poorly maintained BBQs. The real culprit is typically the hose or regulator. Hoses and regulators deteriorate with age and can start leaking. It’s the gas coming from these leaks that ignites and causes the vast majority of BBQ fires. Some experts recommend replacement of the hose and regulator assembly as often as every 5 years. It should cost no more than $50 at your local BBQ store. How can you be sure your equipment is in good shape? You should visually inspect the hose for cracking, splitting or other damage. 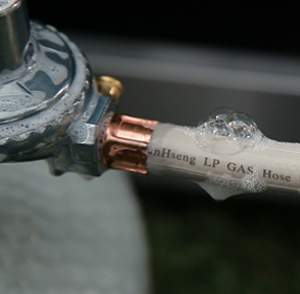 You should inspect the regulator for damage, paying special attention to the part that screws into the gas cylinder. It should be clean, undamaged and if it has rubber O-rings, they also need to be undamaged. Assuming your visual check showed no signs of problems, you should double check with the ‘soapy water test’. Put some soapy water in a spray bottle, turn on the cylinder without turning on the BBQ, then spray the entire valve, regulator and hose assembly with the soapy water. You would see bubbles or smell gas if there is a leak. In addition, you should always turn the gas cylinder off, when not in use. In fact, you should turn the BBQ off at the cylinder first, when you are done cooking.